“U.K. Docs Worry Patients Dying Prematurely,” reads a headline featured this afternoon in CBSNews.com’s Top News menu. The link brings readers to a CBS/AP story with the same headline. A group of British doctors who treat the terminally ill said they were worried that some are dying prematurely because of guidelines on dealing with patients in their final hours. In a letter to The Daily Telegraph newspaper Thursday, six palliative care specialists said the “tick-box approach to the management of death” could become a self-fulfilling prophecy. The guidelines, which are not mandatory, were designed by a hospice in Liverpool and recommended as a model in 2004 by the body that sets national health care standards. They lay out signs that a patient is close to death – including loss of consciousness and difficulty swallowing – and say that once an assessment has been made doctors may remove medication or intravenous drips that are no longer effective. The letter-writers said the problem with the guidance was that “forecasting death is an inexact science” and that some patients might be denied food or fluids, or put under sedation with the result that signs of improvement might be missed. Also Thursday, a report by management consultants McKinsey&Co. advised the health service to cut a tenth of its 1.5 million-strong work force over the next five years to make up a budget shortfall. It also suggested the NHS sell off hospitals and cut back on some services. The government said it had rejected the proposals, which were among many submitted by consulting firms after the government asked for suggestions on how to make up a 20 billion pound ($33 billion) shortfall expected by 2014. 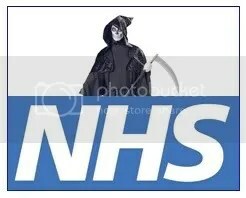 “The government does not believe the right answer to improving the NHS now or in the future is to cut the NHS work force,” Health Minister Mike O’Brien said. There’s a reason Matt Drudge just got done celebrating an all-time record August traffic count. His visitors know that he constantly links to newsworthy stories they likely won’t find reported prominently in establishment U.S. media outlets, if they’re reported at all. Why, if I didn’t know any better, that sounds like a d-d-d-d-death panel, complete with top-down (“senior doctor”) supervision. Under NHS guidance introduced across England to help doctors and medical staff deal with dying patients, they can then have fluid and drugs withdrawn and many are put on continuous sedation until they pass away. But this approach can also mask the signs that their condition is improving, the experts warn. …. (Dr. Hargreaves) added that some patients were being “wrongly” put on the pathway, which created a “self-fulfilling prophecy” that they would die. ….. “It is supposed to let people die with dignity but it can become a self-fulfilling prophecy. Based on the above 16.5% statistic, about 95,000 of the UK’s 574,700 deaths in 2007 “came after continuous deep sedation.” If the UK’s death rate after continuous deep sedation would have replicated Belgium and the Netherlands, about 47,000 fewer would have died under those circumstances. How many of them should still be alive today? The suggestion that the number is in the thousands, if not the tens of thousands, would appear to be not at all unreasonable. So whaddaya think, New York Times, Washington Post, LA Times, Associated Press, and Big 3 networks? In the midst of an attempt to impose a statist health care system on this country, isn’t the fact that one of the oldest statist health care systems in the world is more than likely systematically and prematurely offing thousands of patients a story? Or are you going to let Matt Drudge keep linking to the real news you ignore until you’re no longing just circling the drain, but actually in it?